Stainless steel with 3 grating surfaces and 1 slicing surface. 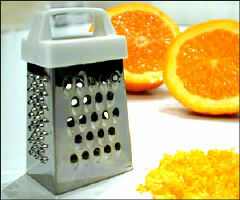 Ideal for garlic, nutmeg, citrus, fruits, chocolate and cheese. Dimensions: 2.5" x 1.5" x 1"